Plug-in hybrid electric vehicles are soaring in demand while second-hand diesel models are slow to clear in some garages in Dublin and larger urban areas, a trend that is expected to accelerate next year. James Brooks, managing director of Kia Motors Ireland, said that demand for the Niro PHEV was growing fast, with 350 being snapped up so far this year and indicated that he could sell 400-500 in the first two months of the new selling season next year. The forecast comes as some of the bigger Dublin dealerships have indicated that larger second-hand diesel models across all brands are becoming harder to sell. This comes as demand for new diesel models across the country has fallen by 10pc. Kia is expecting to launch a fully electric Niro in the second quarter of next year, with the expected range to be in the region of a hefty 400km. And an all-new ProCeed with sporty lines and top specification trim levels will be here in January. This will be the third model in the Ceed range and will fit in the line-up between the new hatchback and the Sportswagon estate. It is longer and lower than the Sportswagon, with a more sporty five-door shooting-brake look in place of the previous three-door version. There will be petrol and diesel versions, priced in the region of €27,000-€28,000, with an expectation of about 250 sales a year. The Ceed Sportswagon has a refreshed look and some new interior improvements for their high-selling Sportage. The Sportswagon has a cargo capacity of 600 litres, larger than many tourers in a larger D-segment. It will have to compete with the ever-growing popularity of the SUV design but Kia feels that the huge carrying capacity – the boot area is 14pc larger than outgoing model – will make it attractive to both fleet and private buyers. It has attractive lines and the starting price for a well kitted-out version is €25,295. 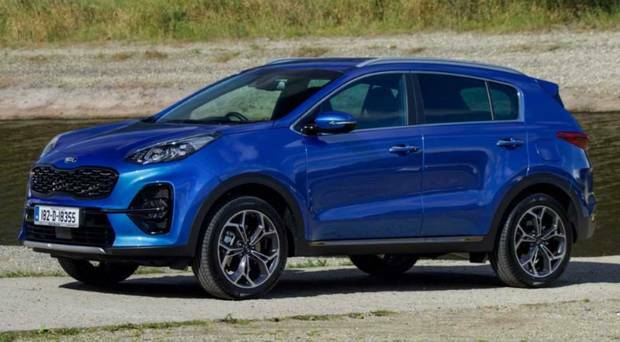 The Sportage is Kia’s global and European best-selling model and here it represents a quarter of the brand’s sales. The updated version gets a new front-end design for sharper looks and an EcoDynamics+ power train cuts Co2 emissions by 4pc under the new, strict WLTP rules, helped by the addition of Stop&Go. The 1.6-litre diesel is the cleanest ever from Kia and produces 115 or 136bhp through a six-speed manual transmission. The more powerful version is available with all-wheel drive and a seven-speed double clutch automatic transmission. There are new driver assist technologies and infotainment systems. Prices start at €24,495, with the top-line GT version coming in at €35,995.